Brilliant, strange, unnerving – just buy it now! You get a phone call. It tells you that you need to go to a hotel and clean a room. You get drive there in your Delorean, don a rubber animal mask and then kill everything that moves in various brutal ways. You then walk out, get a pizza and head home. Sounds a bit mental? Well, that is your life now – you are in Miami baby and the ride is gonna get a bit weird! 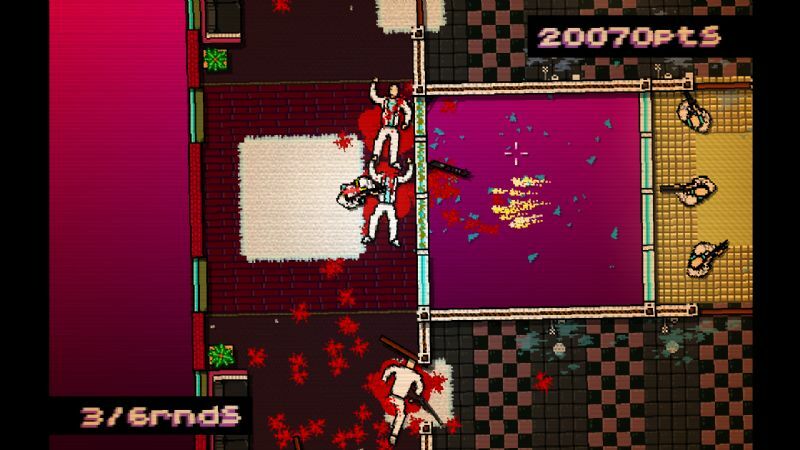 Hotline Miami is game of contrasts. On the one hand it is ultra (and I mean ultra) violent. On the other, it forces you to silently contemplate of the meaning of your actions. All of this in a game that looks and sounds like it came straight from the NES (ask your Dad) in the 1980’s. Each level is based around a building. Your mission is simple, kill everyone in the building and get out. Achieving this goal however, is anything but simple. You will see the “You’re Dead” screen more than any other screen in this game. The joy is, you just won’t care as all you will want to do is try again. 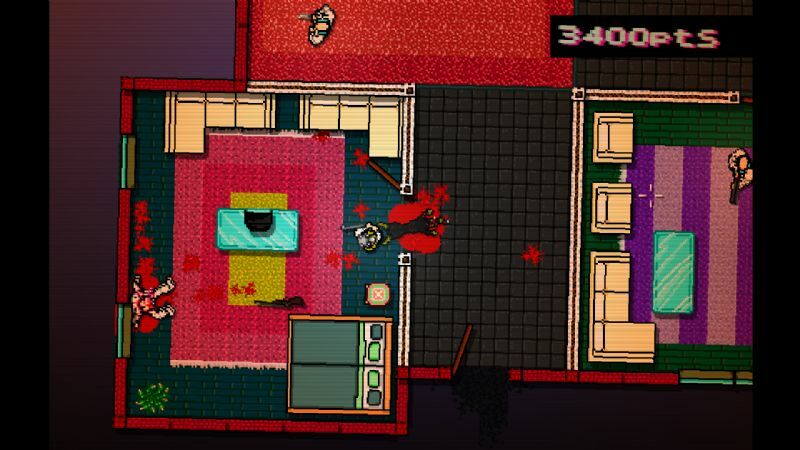 What seems like a simple top down (ish) run and gun is actually a deeply strategic game. Every map has multiple ways of completing it, but some methods will earn you more points than others. Will you choose to kill everyone silently, or take them all down one by one with a shotgun? 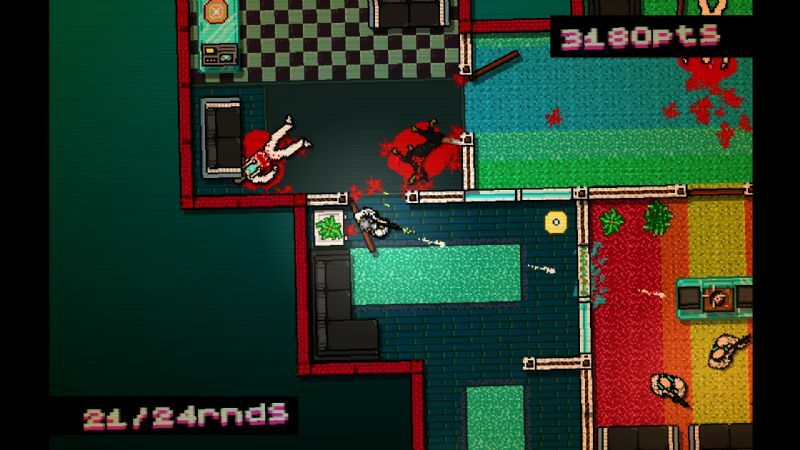 Do you stand near a door and lure the bad guys in with a single gun shot only to bludgeon them to death with a pool queue? Only one thing is certain. You will die. A lot. 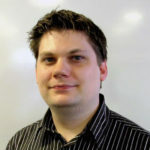 The game looks stunning – as in it will stun you, not “Wow this has the most photo realistic graphics ever”. Each level is bordering on psychedelic, with a top down camera that never quite seems steady, purple haze fills the outskirts of the screen whilst scan lines cover everything. As the game progresses and you seem to fall deeper into some kind of psychosis, it all begins to get a little vaguer and dream like. The music is just as great. 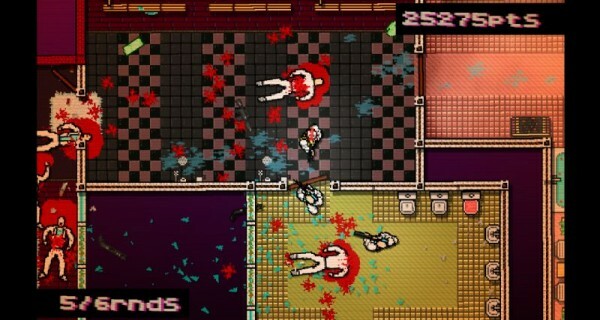 Your killing sprees are accompanied by thumping elctronica, that stop the exact moment you kill the last person. Once the music has stopped, you then have to walk silently back through the level, surveying your destruction. It is a strange and slightly eerie moment in each level – all adding to the overall dream like feel of the game. As you complete each level, depending on the level of violence, combos, variety and more, you get a score and a grade (A+ being the highest). 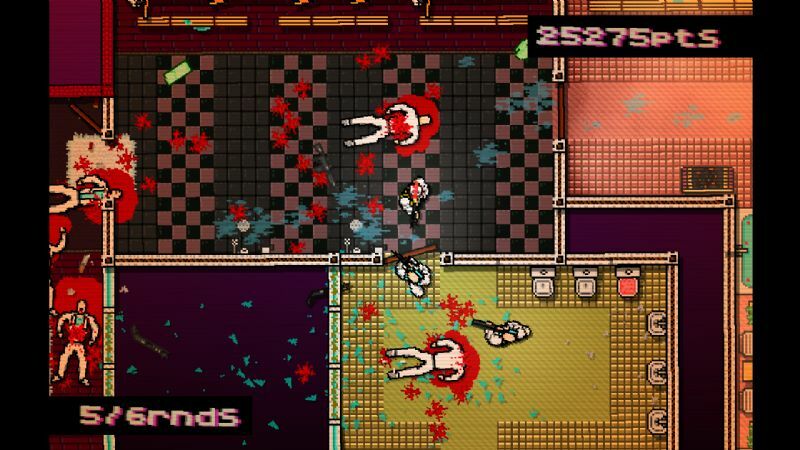 High scores open up new weapons, from broken bottles to machine guns and more. As well as new weapons, you get new rubber masks. Each mask has certain abilities. One lets you see more of the map, another makes opening doors on your victims lethal and much, much more. Choosing the right mask at the start of a map is often critical in getting the best scores. I won’t go in to the story – you need to experience that for yourself, suffice to say it will make you think a lot about what is actually happening in the game and why. Controls are the only part of the game that felt a little bit like a let down. Mouse and WASD work well, but the mouse control is a little frustrating at times. The number of times I have died because I was facing the wrong way! That said, it never really takes away from the utter brilliance of this game. I was asking for experiences rather than JUST games recently. 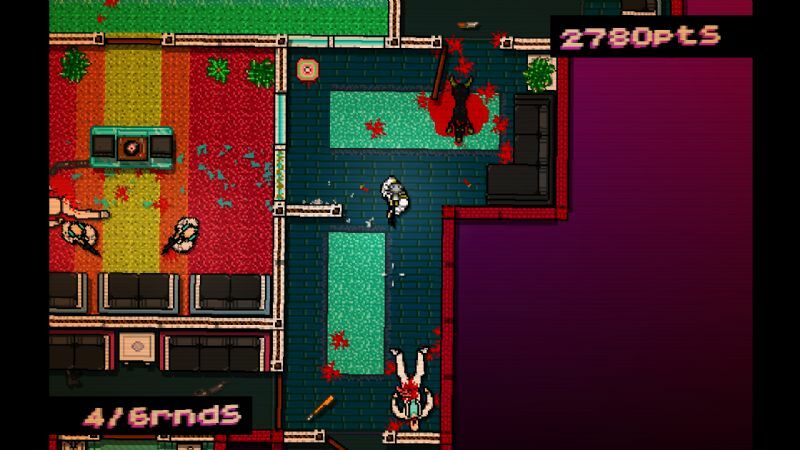 Hotline Miami is a massive dose of experience. It is a master class in game design. Hard as nails, unforgiving and frustrating as hell – but you always come back for more. Not one for the kids, but grown ups should go and buy it now!